without dead space. High torque is reached at low circumferential speed. We offer a wide range of mixing and kneading tools and can provide special tank shapes with extra wear protection as well as heating and cooling. When it comes to fluids, pastes and powdery products, this machine’s dispersion performance is excellent even with highly viscous products, also those not free-flowing anymore. The dissolver shaft (also multiple mixing shafts are possible) and the planetary operation can be controlled independently via separate drives. We offer tank volumes of 6 litres to up to 7000 litres. This machine brings together the benefits of conventional planetary mixers and the highly intensive dispersing effect of dissolvers. 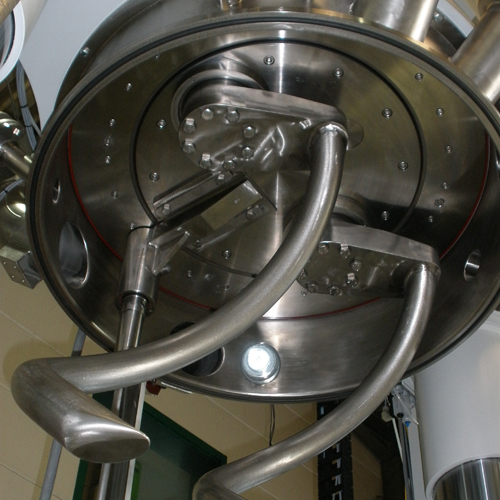 The dissolver shaft, which can be controlled separately and which runs while the planetary drive is on, is forced through the mixture, therefore allowing highly filled components to be mixed. The machine is available in tank sizes of 6 to up to 2000 litres.